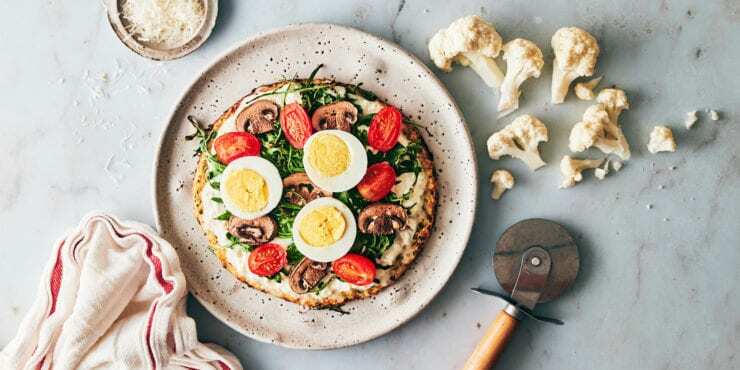 Cooking meals that are healthy and delicious can be time-consuming, especially if you’re trying to make everything from scratch. And let’s not even talk about how frustrating it is when you don’t get around to using all your fresh produce and you’re left with wilted veggies and moldy fruits! 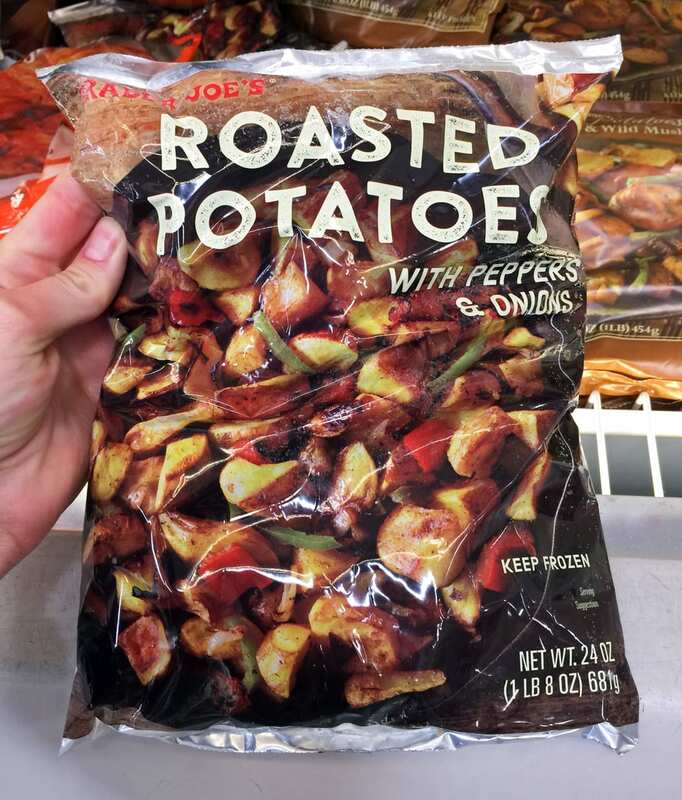 Fortunately, Trader Joe’s can help save you time, sanity, and wasted food with their selection of delicious, healthy frozen foods. And we’re not just talking about boring old bags of broccoli — TJ’s has full frozen meals ready to defrost and devour! 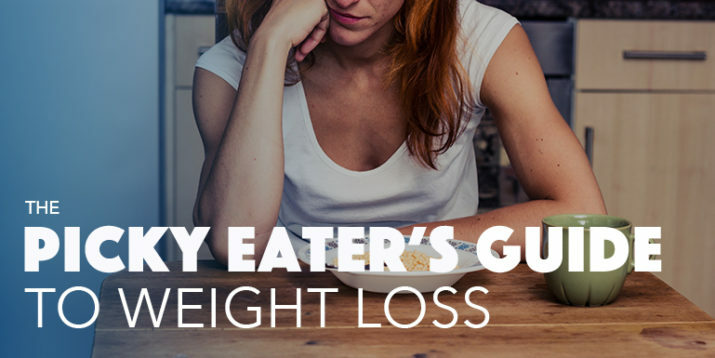 Better yet, some of them are actually pretty darn good for you. PSA: Frozen fruits and veggies are just as good for you as fresh, and they last a whole lot longer! 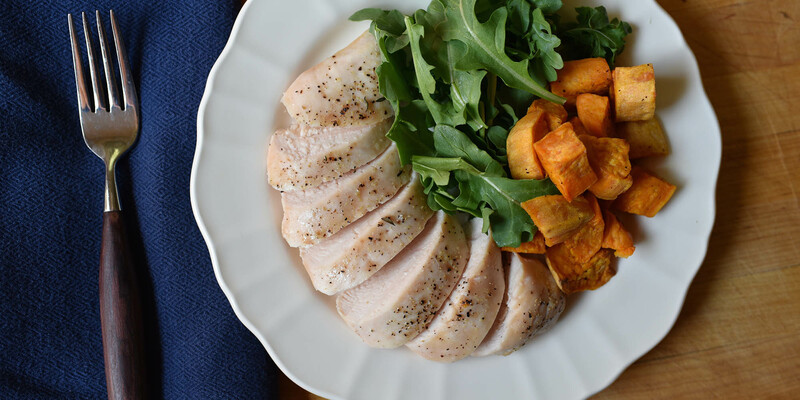 Ready to whip up a satisfying, nutritious meal in mere minutes? 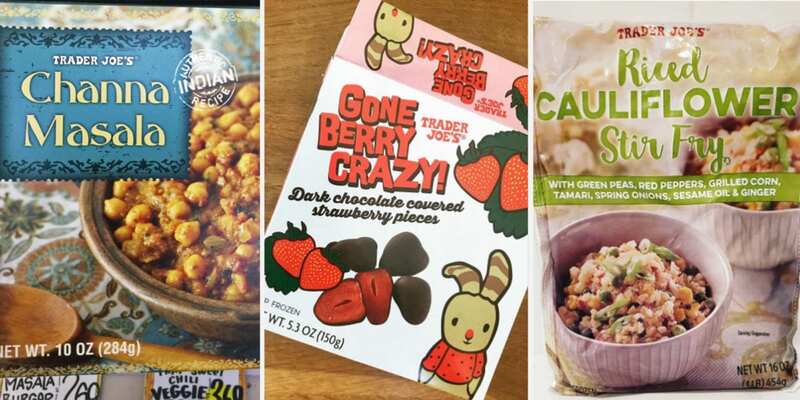 Here’s our guide to the healthiest foods in the frozen aisle at Trader Joe’s. Round out your breakfast with a side of roasted potatoes. This potato, pepper, and onion mix is perfectly spiced with rosemary, garlic, and sage, and has just 110 calories per serving. It’s also low in carbs with just 14 grams, and low in saturated fat with just 1 gram. Pair these spuds with a hearty omelet, veggie scramble, or side of turkey bacon for a hearty start to your day. It’s easy to rack up calories and sugar when buying smoothies and smoothie bowls, but these frozen açai puree packets let you make satisfying, healthy breakfasts at home. One pack of unsweetened organic açai has just 80 calories, four grams of carbs, three grams of fiber, and zero — yes, zero! — grams of sugar. Eat your açai plain or blend it with fruit, spinach, chia seeds, Greek yogurt (plain, 2%), or nut butter for a deliciously healthy morning meal. 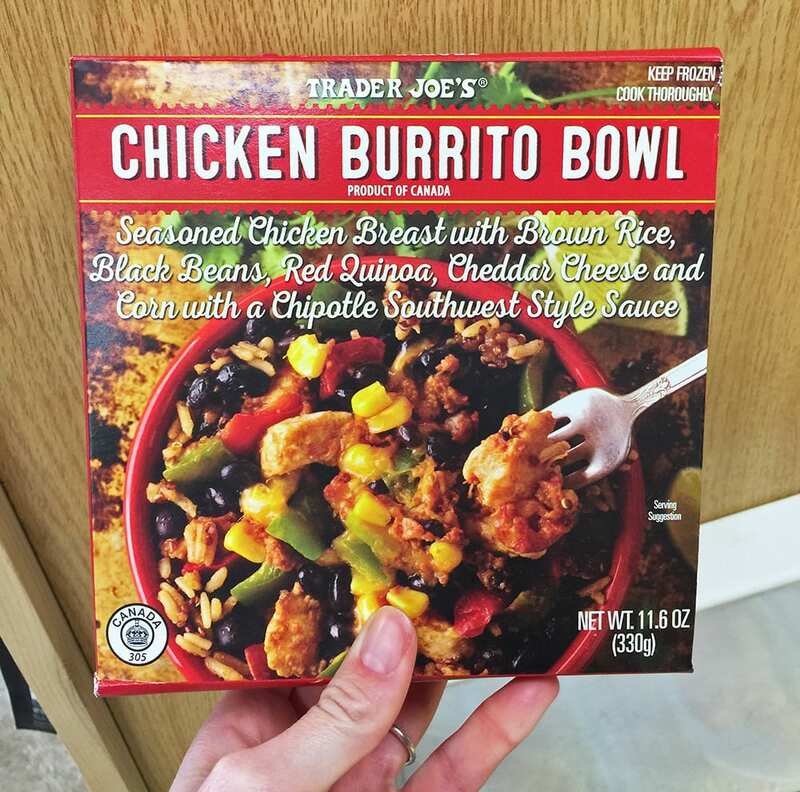 Trader Joe’s Chicken Burrito Bowl is a great option for eating healthy when you’re on-the-go. The spicy, Southwest-style dish features chicken breast seasoned with garlic and chili powder, brown rice, quinoa, black beans, corn, bell pepper, and a sprinkle of cheddar cheese. 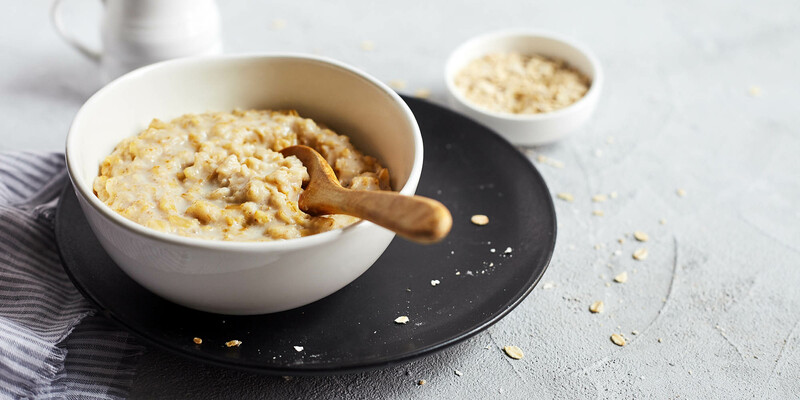 One bowl has 370 calories, nine grams of fiber, and a whopping 22 grams of protein. To make your life as easy as possible, you can enjoy this by just heating it up and eating it as is. Or, if you want to shake things up a bit, use it as the filling for tacos — bonus points if you use lettuce leaves as the wraps! 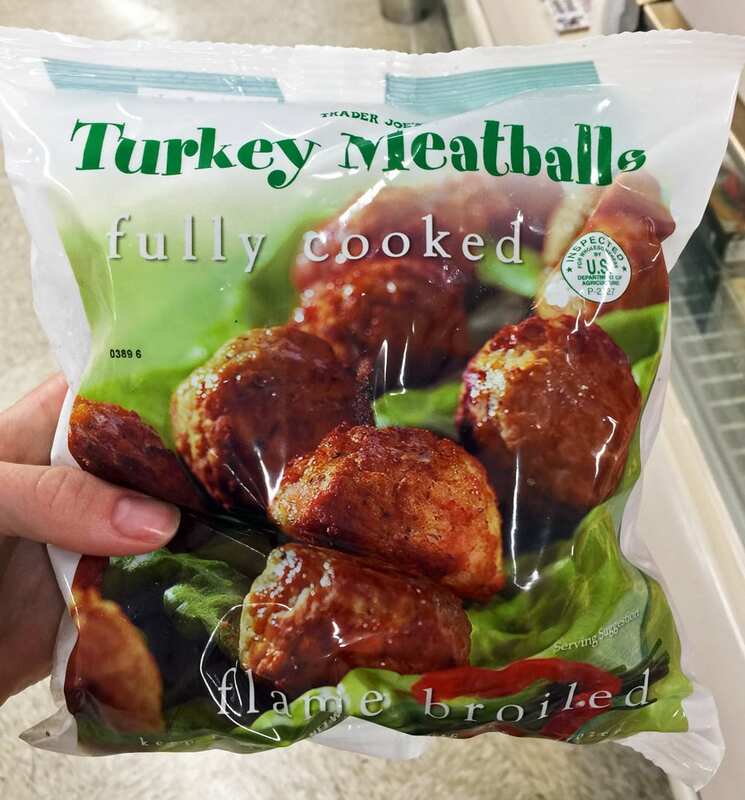 Seasoned with garlic, parsley, and onion, these frozen turkey meatballs are a simple, tasty way to add protein to any dish. A standard serving (two meatballs) has 12 grams of protein and five grams of fiber, with just two grams of saturated fat. Cook up a couple meatballs to top a roasted veggie salad, rice bowl, or cup of chickpea pasta. It couldn’t be easier! 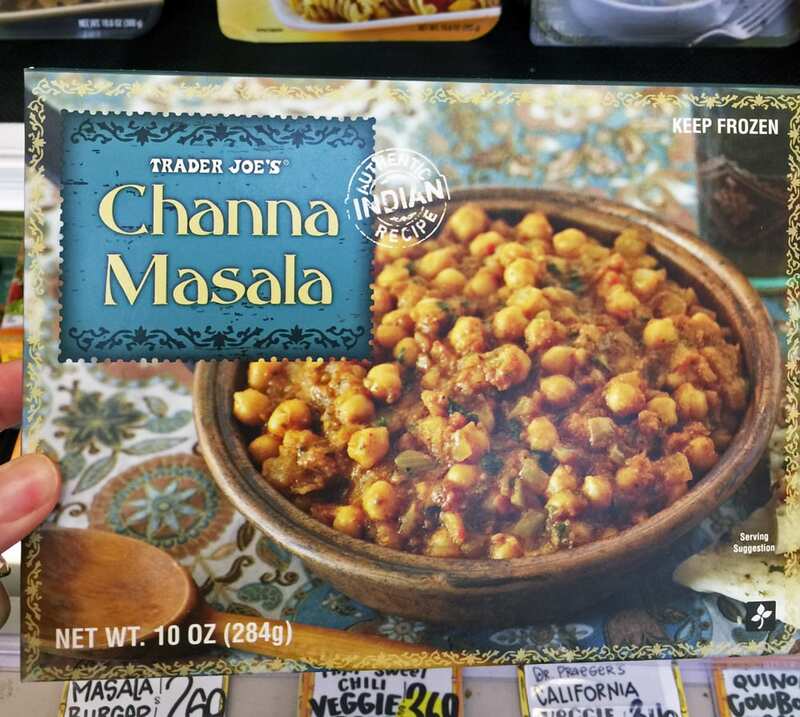 Trader Joe’s Channa Masala gives frozen vegetarian meals a whole new meaning. This popular Indian dish features garbanzo beans, onions, tomato, pepper, and spices like cumin, turmeric, garlic, and fenugreek for a spicy, rich flavor. Half the package of channa masala contains 180 calories and six grams of fiber and protein each. Complete your plate by adding some greens, like a side of roasted veggies or handful of sautéed spinach. 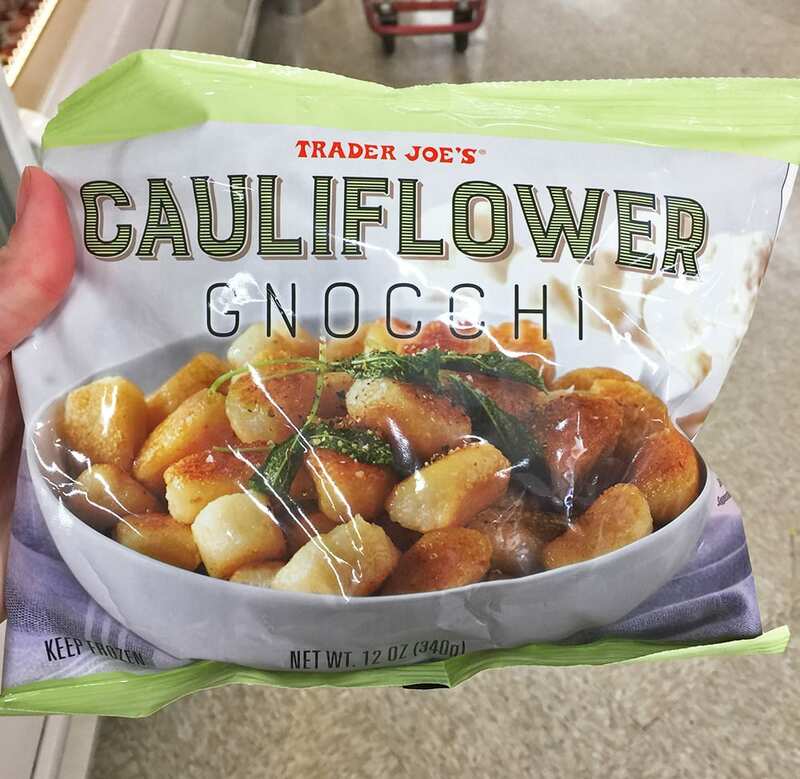 Trader Joe’s genius Cauliflower Gnocchi has half the carbs you’ll find in the traditional potato pasta — but just as much flavor. Made from a blend of cauliflower, cassava flour, and potato starch with sea salt and olive oil, this gnocchi is grain-free and contains just 140 calories and 22 grams of carbs per cup. To really bring out the best of the frozen dish, toss these sautéed dumplings with fresh basil, tomato sauce, pesto, or a little bit of olive oil. When you don’t want to cook but still need a satisfying protein to add to weeknight dinners, look no further than Trader Joe’s Jerk Chicken Thigh Skewers With Mango Chutney. These grilled chicken skewers are seasoned with garlic, ginger, lemon, paprika, and chili. Two skewers provide 19 grams of protein and contain just 100 calories (without sauce). Looking to complete the meal? Pair your grilled chicken with a fresh spinach salad or side of cilantro-lime brown rice to round out the protein. Trader Joe’s Riced Cauliflower Stir Fry is a delicious, low-calorie spin on fried rice. The hearty cauliflower base is topped with peas, red pepper, grilled corn, and spring onions, then seasoned with tamari, sesame oil, and ginger for a savory kick. 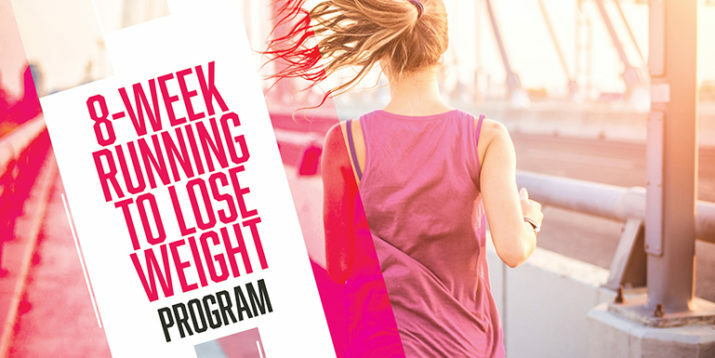 One cup runs you just 50 calories and seven grams of carbs, with two grams of fiber and protein each. 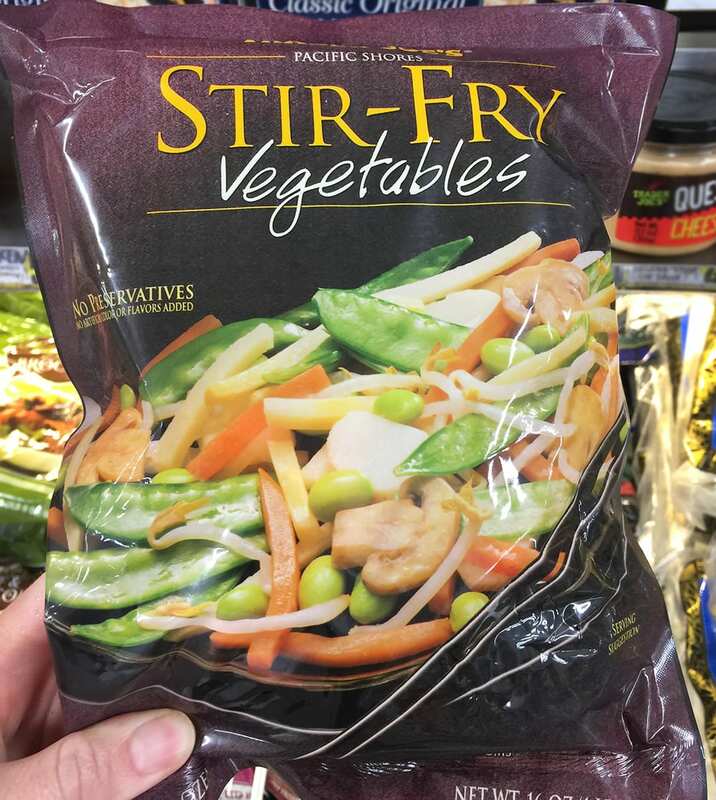 Eat the stir-fry on its own, add a fried egg on top, or serve it alongside a few slices of grilled chicken. With “superfood” in the name, you know this is going to be good. 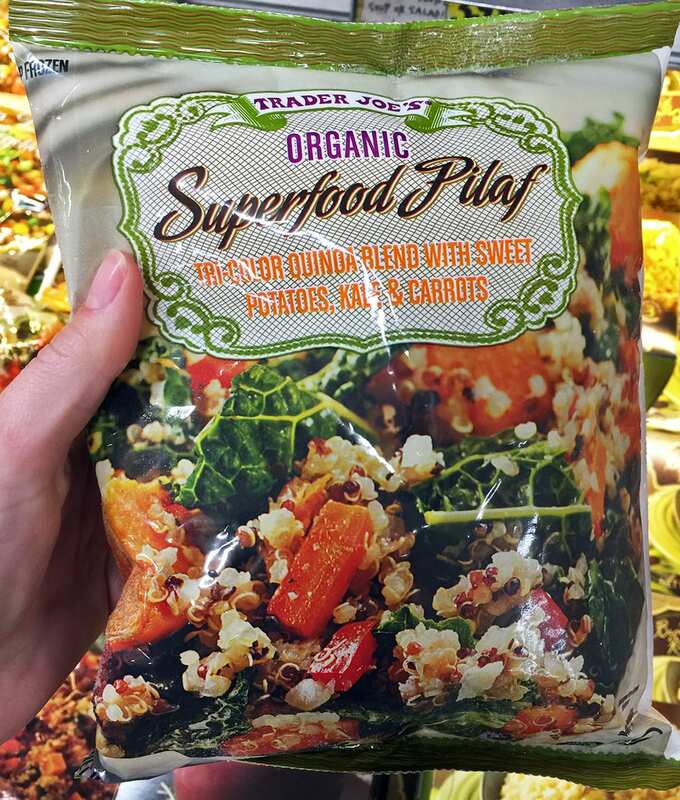 This superfood pilaf is loaded with vegetables and whole grains, like tri-colored quinoa, sweet potato, carrots, kale, and red bell pepper. 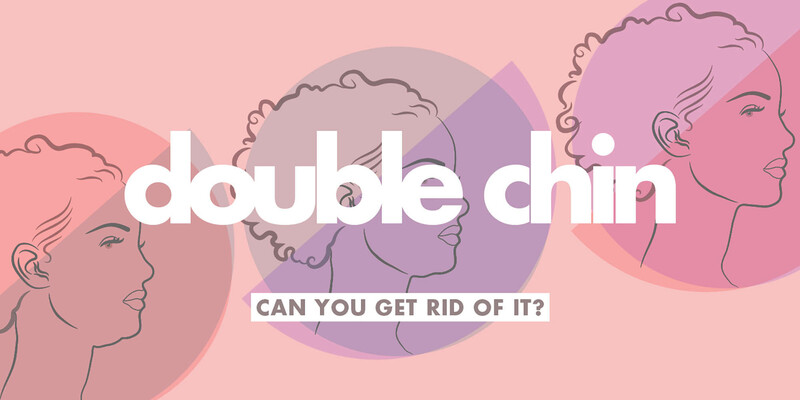 One cup contains 160 calories, 25 grams of carbs, and three grams of dietary fiber. And there’s no one way to enjoy it! You can use it to bulk up your salad, pair it with a bowl of soup, or toss some grilled chicken breast in for a protein-packed superfood mash-up. This frozen veggie medley is an easy way to add nutrients, color, and flavor to a meal. 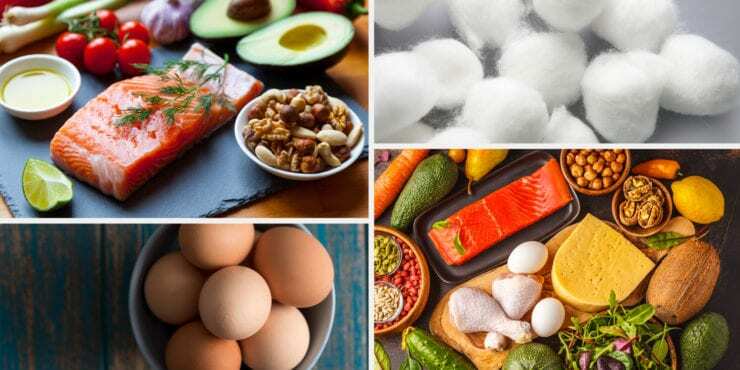 The mix of pea pods, bean sprouts, bamboo shoots, soybeans, water chestnuts, carrots, and mushrooms has 45 calories a cup, plus two grams of fiber and three grams of protein. Sautée these veggies with a splash of coconut aminos, and serve them alongside a scoop of brown rice and handful of grilled shrimp for a perfectly portioned and balanced meal. This bag of mixed raspberries, strawberries, blueberries, and blackberries is great to have on hand for healthy breakfasts, snacks, and desserts. A standard serving (¾ cup) has just 80 calories and contains five grams of fiber. Blend a handful of berries into a spinach smoothie, toss them into a cup of Greek yogurt for an easy breakfast, or snack on them plain after dinner. 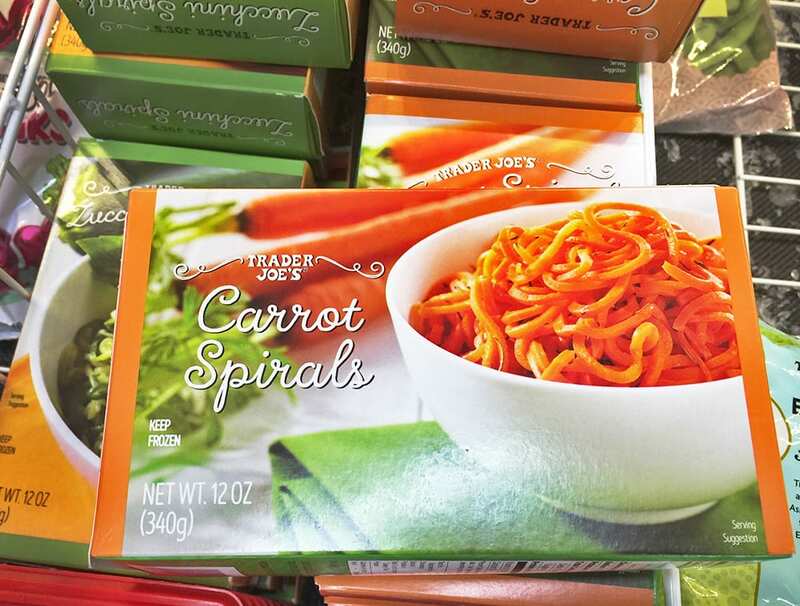 Trader Joe’s frozen Carrot Spirals are simple, versatile, and super good for you. The coveted trifecta! And these aren’t just regular carrots — they’re cool carrots that are shaved into noodles and topped with a sprinkle of sea salt to bring out their natural sweetness. They contain two grams of fiber and are just 35 calories per serving. Add them into stir-fry, a salad for extra color and texture, or even a smoothie! If you don’t feel like slicing up a head of cauliflower and then tossing it on the grill to bring out its sweet flavor, you’re in luck! This frozen option has all of that done for you already. Defrost them to use them cold or heat them up, and use them whole or mashed — the options are nearly limitless! These frozen chocolate-covered banana coins make the perfect sweet treat when you’re craving something sweet and chocolaty. Four banana slices dipped in milk chocolate contain 130 calories and 12 grams of sugar. Don’t mind if we do! If bananas aren’t your thing, you have another option for a fruity chocolaty dessert with this strawberry treat! TJ’s took sliced Thai strawberries, covered them in dark chocolate, and froze them so you can enjoy them whenever you please. You can pop six of these lil’ guys into your mouth for just 100 calories and 12 grams of sugar.